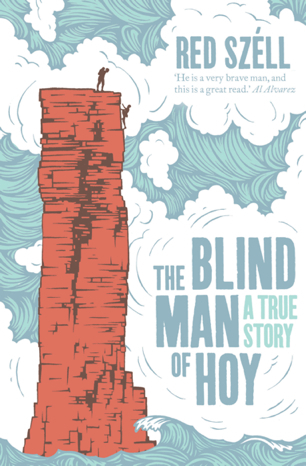 Last year I became the first blind person to climb The Old Man of Hoy, a sea stack in the Orkneys roughly the shape and size of The Gherkin. I’ve fought long and hard to retain my independence as my sight has ebbed away. Some days the challenge can seem overwhelming – but I don’t give in. me to try and cross Oxford Street last month. As if the prospect of buses hurtling up and down the capital’s premier shopping street in a seemingly continuous two-storey red caterpillar was not intimidation enough, some joker has decided to cut the time you have to get across the pedestrian crossings to a hair-whitening six seconds. I’m a fit healthy 44 year-old. Okay at 5% of normal my vision doesn’t exactly permit me to break into a sprint but with my white stick sweeping the path ahead I can still move at a fair pace. But six seconds to cross four lanes allows no margin for error. I’d already rejected the alternative of using the diagonal crossing at Oxford Circus. I know my limits and 17 seconds to get from the kerb to the centre of the crossroads, re-orientate myself and then reach the far corner against an LED clock (invisible to me) that counts down the seconds to annihilation is beyond risky. At least the traditional pedestrian crossing was straight across the four lanes. Six seconds. Deep breath. Being unable to see the green man I set of half a second after the crowd I’d hoped would help sweep me across, their trotting footfalls quickly pulling away from me to be replaced by the stampede of those crossing in the opposite direction. Bumped and jostled by this oncoming traffic I was becoming increasingly aware of the growling buses on either side of me, straining against the unwelcome impediment to their progress. How dare these pedestrians stray onto their highway? As engines began to rev and snarl a fearless young woman, more streetwise than me, seized my arm and hurried me across the final few metres. My feet had barely found the reassuring bobbles of the tactile paving before the first bus thundered by, uncomfortably close to the back of my head. I’d been terrified – but what about elderly pedestrians or those with young children? A lot of people move slower than me. Six seconds to cross four lanes leaves no margin for error. Now in case you think I’m some country mouse come to the capital to blow my savings on the Monopoly board’s green streets, I’ve lived in London for 25 years, spent the 1990’s working in Mayfair and still visit the West End regularly to shop or to record items at Broadcasting House. During that quarter century I’ve witnessed Oxford Street become more and more hostile to the very shoppers it seeks to attract. Under the lash of TFL timetable targets bus drivers are forced to rush to meet increasingly tight deadlines. To speed their progress TFL has cut crossing time for pedestrians, forcing them to race for their lives. Making people rush, be they drivers or pedestrians, increases the likelihood of accidents. I was still feeling rattled an hour later and so turned my weary steps towards Great Portland Street and the idiosyncrasies of the Circle Line. A forty-minute detour seemed infinitely preferable to putting my life back into the London bus lottery. Last week Network Rail was forced to concede that labelling those killed on level-crossings as ‘trespassers’ was wrong. Until TFL stops regarding pedestrians using designated crossings on Oxford Street as impediments to the smooth running of its over-optimistic timetables I will be making the same dog-leg to my journey and doing my shopping at Westfield. Red Szell is an author and rock climber who regularly contributes to BBC Radio 4’s In Touch programme. I’m tired of being pushed around. It seems I can’t leave London without some well-meaning soul fetching a wheelchair for me – ‘to make things easier’. Last time I checked, my visual impairment hadn’t spread to my legs. It’s bad enough losing one area of independence without having another snatched away. Recently I turned up to Stansted Airport, having navigated my way there unaided, on time, with a rucksack full of climbing gear and ready to tackle an Italian rockface. All I wanted was a bit of guidance through the gloom to the departure gate – but oh no, instead my arrival initiated ‘a procedure’. I was ushered into a corner, seated and told to wait. Resistance was futile – I had entered the Health & Safety zone. Forty minutes later, with my flight being called for the final time, the inevitable wheelchair was produced. My wheezing charioteer was significantly older and rounder than me and I feared for her wellbeing throughout the ensuing white-knuckle slalom. It’s not just airports. At Victoria Station I made the schoolboy error of checking at the ticket barrier that I had the right platform. ‘You travelling alone?’ asked the guard. When I replied I was he held me there and radioed for backup. There was, he explained, a danger I might fall down the gap between the train and the platform. I explained I was in a hurry. He explained he was doing his job. The minutes ticked by and I considered vaulting the barrier. Eventually an electric buggy arrived but the train had departed. After an hour’s wait I was driven 15 metres to the next train. Apparently this service was provided to ‘facilitate my journey’! I shouldn’t be surprised. It’s the same impulse that drives hosts at parties to seat me on arrival. And I don’t want to sound churlish. An offer of genuine assistance is a joy to receive but being subjected to a one-size-fits-all risk assessment solution is like being labelled a liability for daring to set foot outdoors. I know that airport and railway staff have a duty of care and a host has every right to direct proceedings at his or her own party, but these well-meaning souls should consider that I live with my condition and a good doctor consults with the patient before dispensing treatment.